One of my favourite easy home-cooked meal is finding whatever is in the fridge and putting them together in less than 30 minutes. It definitely comes in handy when one is starving! I know I can always count on my vegetables and my go-to main staple, leftover brown rice, to make a yummy bowl of fried rice for dinner. In honour of Lunar New Year a.k.a Chinese New Year in my world, I am excited to share this simple and quick vegetarian fried rice recipe, à la Violet style, with you. 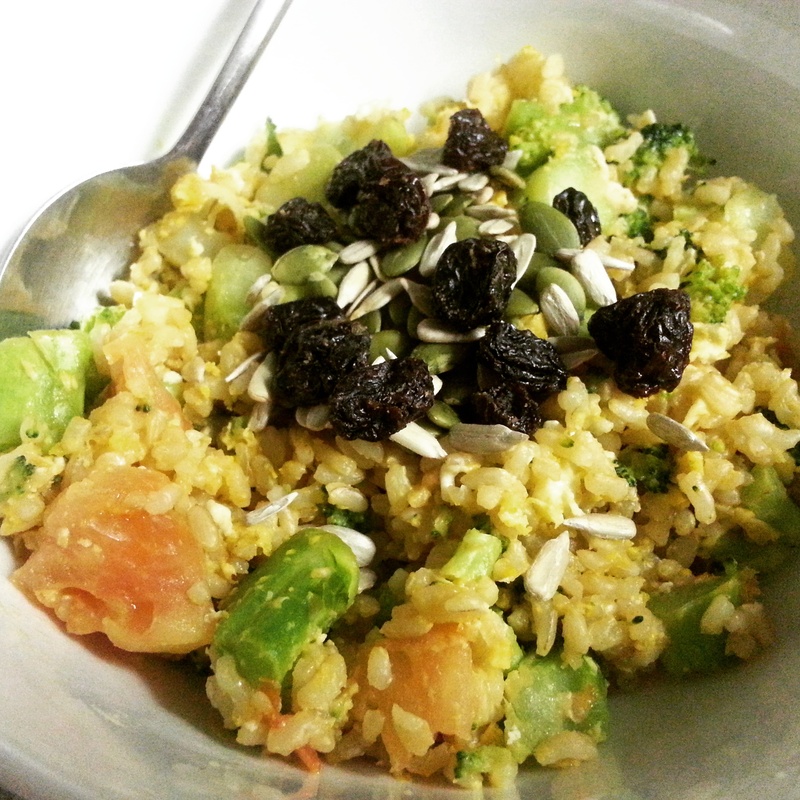 The beauty of this recipe is that any rice and veggies will work! 1. Heat a wok or frying pan and add 1 tablespoon of oil or less (according to your preference) over medium-high heat and when the oil heats up, add in the egg. Cook and stir until the egg is lightly scrambled, not too dry. Remove egg from wok/pan and place in a separate plate/bowl for now. 2. If needed, add a little bit more oil into the wok/pan and add the garlic and ginger; briefly stirfry until they just show signs of changing colour or until fragrant. 3. Add the rice and stirfry it for a few minutes, using chopsticks or a wooden spoon, to break it apart. 4. When the rice is heated through, add the broccoli and tomato, and cook, until the broccoli is crisp-tender. 5. Stir in the soy sauce as desired and add the scrambled egg back into the wok/pan. Mix thoroughly and quickly. 6. Serve hot in a bowl, and sprinkle with your choice of toppings. -If you want to add other ingredients, or serve more people, simply double or triple the recipe. 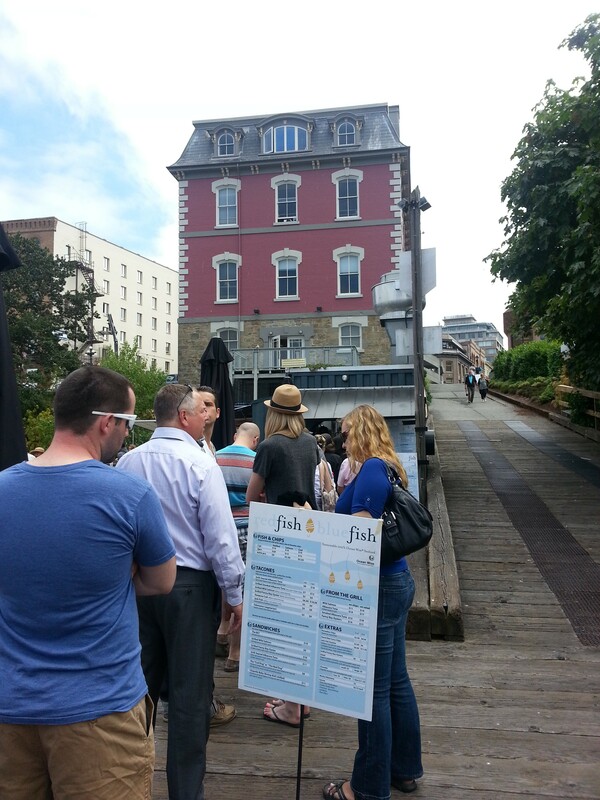 Red Fish Blue Fish: Best Fish & Chips with a Beautiful View in Victoria, BC! 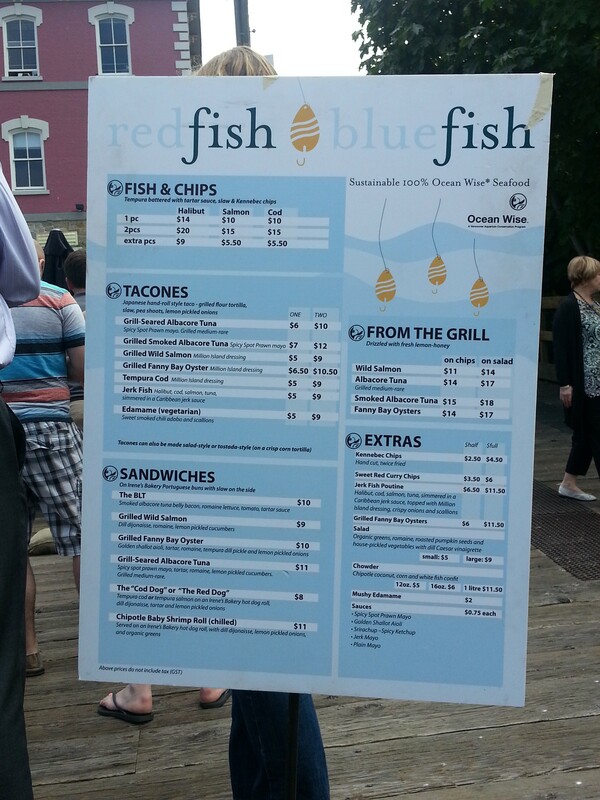 A friend of mine recommended that I have to try Red Fish Blue Fish if I visit Victoria, British Columbia. According to him, it is very popular and they make the best Fish & Chips from fresh and sustainable fish. Therefore, the minute we stepped off the bus that took us from the ferry terminal into downtown Victoria, we went in search for this famous place. I was looking forward to trying some tasty Fish & Chips since the last time I had the best ones ever was in London, England about 2 years ago. Ever since returning to Canada, the Fish & Chips I’ve tried have been rather disappointing since I tasted more batter and oil than the actual fish. When we arrived around 11:30am, there was already a line up! We assumed it was a sit-down restaurant, but it turned out to be a little eatery, made of an “up-cycled cargo container” (according to its website). We used the time while waiting to examine the menu and debated what kind of Fish & Chips to have. There were so many yummy options other than Fish & Chips but we couldn’t try them since we had to leave some room in our tummies for our Afternoon Tea at the Empress afterwards, so in the end we decided we will just try Fish & Chips. We shared 1 piece of Salmon Fish & Chips and 1 piece of Cod Fish & Chips. Each fish came with tartar sauce, coleslaw and Kennebec chips. I wanted to try the salmon since it is well known in British Columbia and I’ve never had Salmon Fish & Chips before. Ordering 1 piece of Fish & Chips is enough since the portion size is large and it tastes sooooooooooooooo good! When you bite into the fish, you can actually taste the freshness and tenderness of it. The batter was made just right; it was light and crispy, and you can barely taste or feel the deep fry oil, unlike some other Fish & Chips I’ve tried. Paired with the tartar sauce, coleslaw and the side of well-seasoned crispy Kennebec fries, it was perfect! Overall, we enjoyed the Salmon Fish & Chips more than the Cod Fish & Chips because we found that there was more “meat” to eat than the cod. The salmon had more flesh whereas the cod had less so when you bite into it, you taste more of the batter and less of the fish. Therefore, we felt cheated! However, that’s just a personal preference. Some people might prefer the taste of cod more so they will of course savour every little bite they can get from it. When we left, the line was still long and it seemed never ending. Clearly, it shows how popular this place is because of its food and the wait in line is well worth it in the end. According to Han Bok-ryeo, the Director of the Institute of Korean Royal Cuisine: “Korean food is a great source of energy, and for Koreans, energy goes beyond physical strength, it pertains to strength of the mind and soul.” Also, Korean traditional wisdom states that “food and medicine are grown from the same root,” and therefore “there is no better medicine than food.” (taken from Korean Cuisine: Refresh Your Senses by Korea Tourism Organization, December 2009) This philosophy demonstrates that food is very important to the Koreans, and it is made with care and thought into the overall well-being and health of its people. After discovering I am gluten sensitive, my naturopathic doctor said that I can still have rice, because it has no gluten. Thank goodness I can still eat rice, since rice is a staple of Korean food, and I especially love its signature dish: Bibimbap! This weekend I decided to give it a try, making homemade Bibimbap, as I’m discovering I enjoy cooking more and more, and this version is so much healthier than eating out! The following recipe is taught and given to me by my dearest Korean friend Chris. –Vegetables: You can substitute the vegetables in this recipe with any veggies you like. The idea is to make it as colourful as possible so the bibimbap looks beautiful and eating a rainbow of vegetables is good for you!! –Rice: Make water less than normal in the rice cooker/pot so the rice is not as soft as usual, since after you still need to cook it in a big pan. 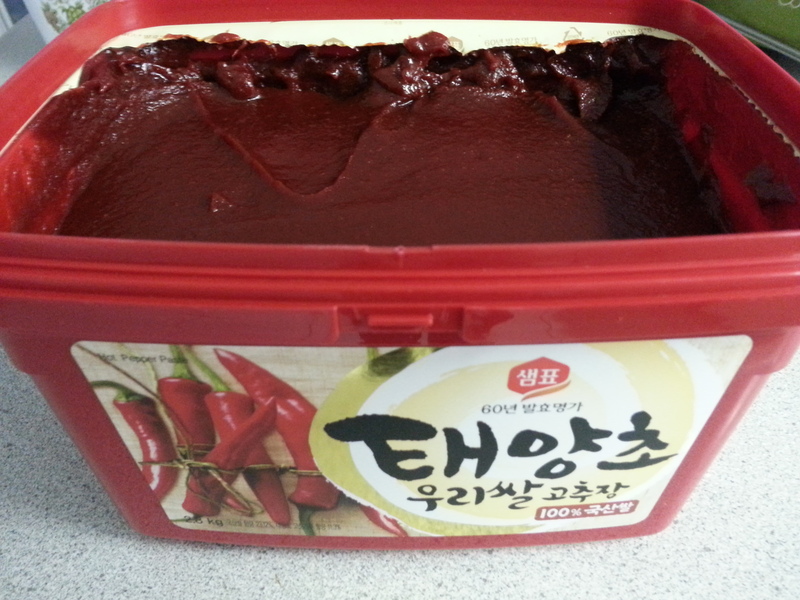 –Spicy level: You can adjust the spiciness of the chili/hot pepper paste to your preference by either decreasing or increasing the tablespoons used for flavouring. –Egg: You can cook it sunny-side up if you like. –Optional: Roasted seaweed. 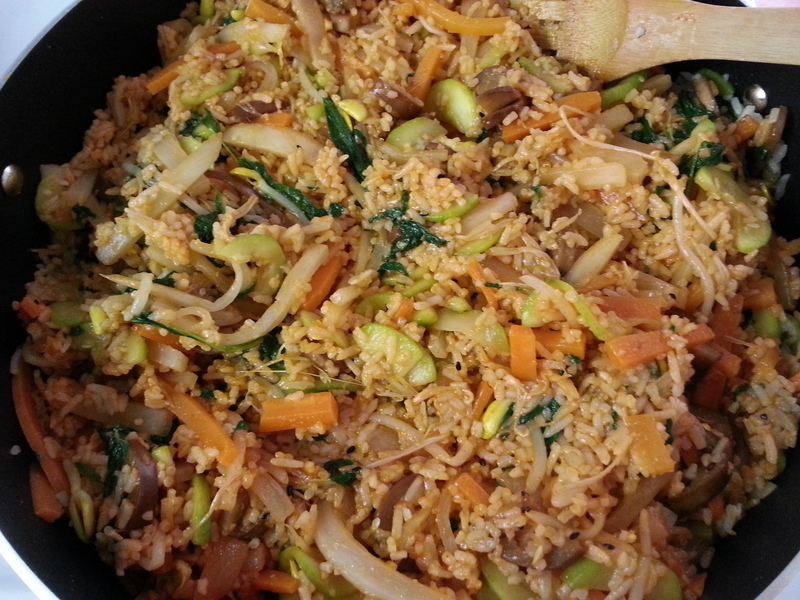 I personally like putting it in the bibimbap because it gives that extra crunch and flavour! 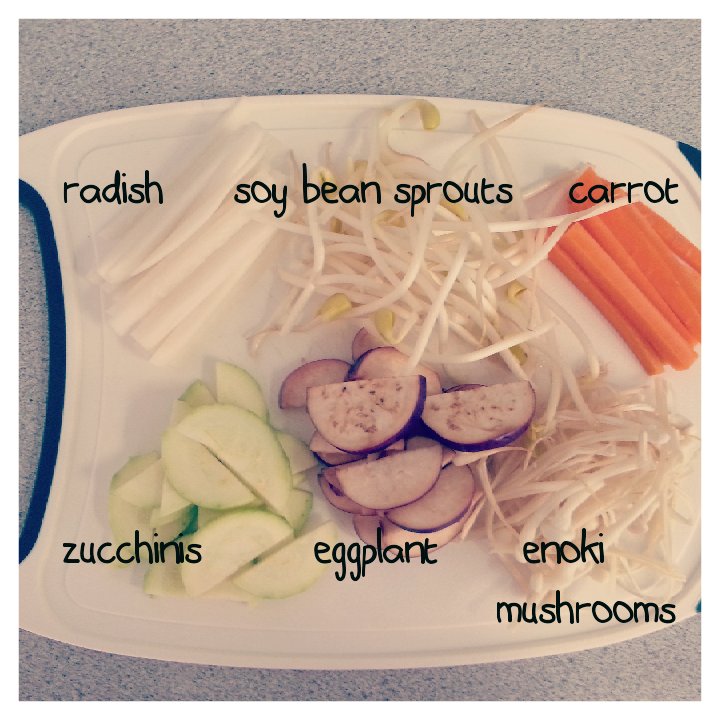 All the vegetables needed for the bibimbap. Only spinach is missing. 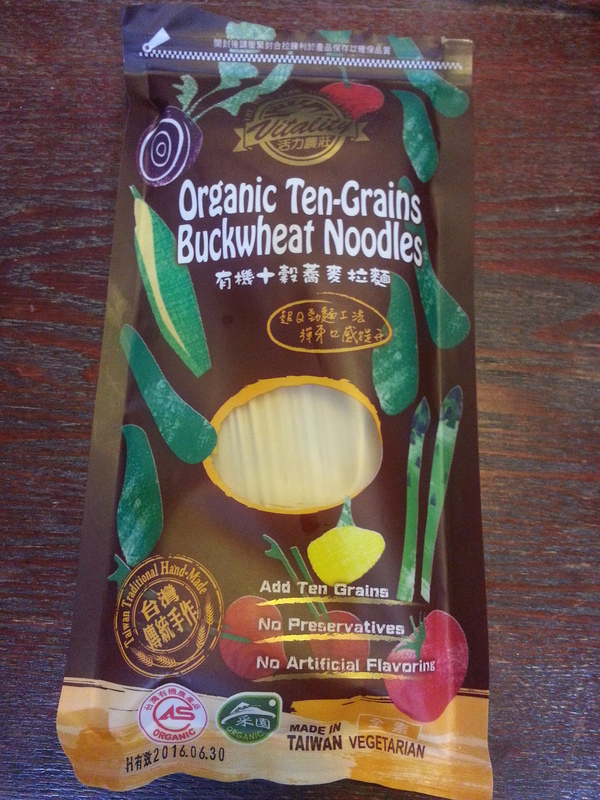 You can get this from any Korean supermarket and my friend recommended buying a big tub, since it can be refrigerated and lasts for 6 months! Unlike the bibimbap I’m used to eating in Korean restaurants, where the vegetables are on top of the cooked rice in a bowl (and I need to mix everything), this bibimbap’s toppings are already mixed in while cooking! 1. Lightly blanch (about 30 seconds, and for the carrots, a bit longer like approximately 60 seconds or less) each vegetable in boiling water, and drain. 2. Put all vegetables in a big pan. 3. Pour sesame oil all around the vegetables, but not too much. 4. Put rice into pan with vegetables and start mixing on medium heat. 5. Slowly add salt to the mix for seasoning. 6. Add hot pepper sauce all around and start mixing until evenly distributed and cooked. Set aside and it’s best to cover the bibimbap in the pan with a lid so when you serve it, it’s still hot. 7. Fry eggs in a frying pan. One egg per person/bowl. 8. Cut seaweed into strips or squares. 9. 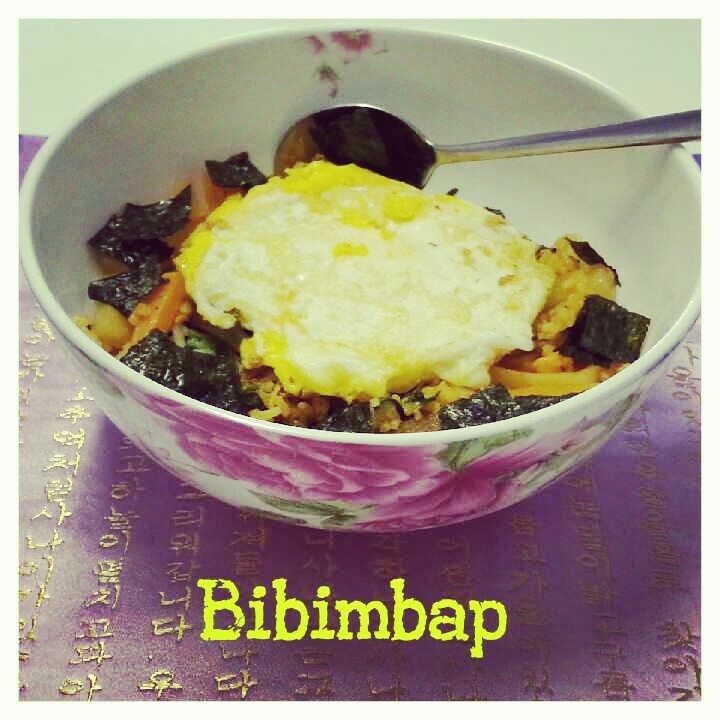 Place bibimbap into bowls, sprinkle some seaweed and put an egg on top of each bowl. A Healthy Fast Food Alternative: Gluten-Free Pizza!! As I continue on my gluten-free eating journey, I’m now exploring places that offer gluten-free options. Yesterday, my dear cousin came along with me on my little gluten-free adventure: finding a healthy and quick lunch! We went to check out Pizzaville, a fast food franchise across Southern Ontario, to try its gluten-free pizza, as recommended by a friend of mine. 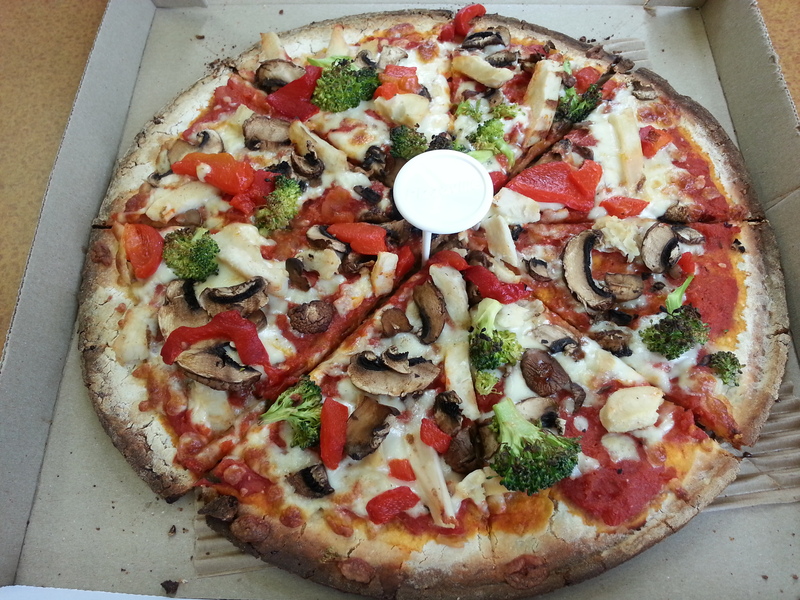 We ordered one with the following toppings: grilled chicken, mushrooms, broccoli, red peppers and light cheese. The gluten-free pizza is only offered in one size (8 slices) and on extra thin crust. The amazing thing is that the gluten-free crust is made with flaxseeds, which is high in fibre. 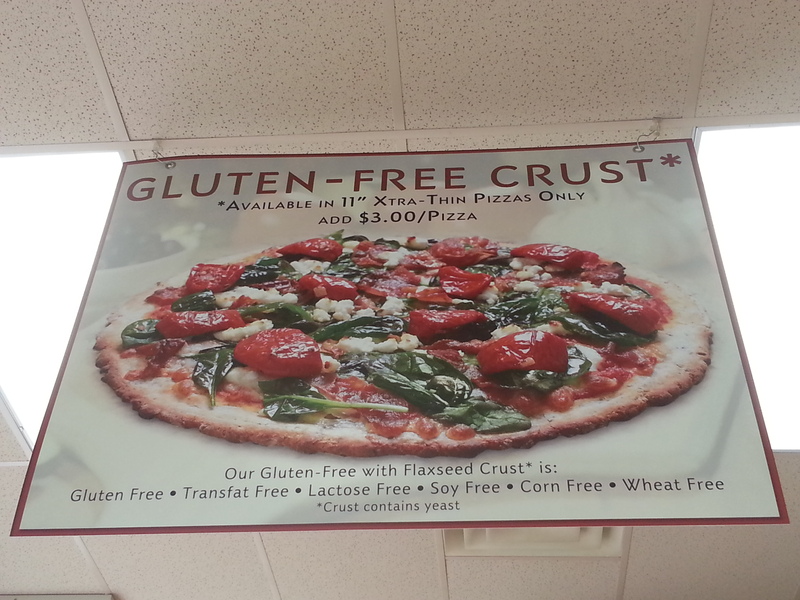 I took a photo of the gluten-free pizza poster in the store so you can read for yourself how healthy it is. Overall, we found the taste of the gluten-free pizza very delicious, fresh (you can actually taste the REAL flavour of the tomato sauce and vegetables, and the chewy texture of the flaxseeds), crispy and light. My cousin, who is not gluten sensitive, was surprised that this pizza was not greasy at all in comparison to a regular pizza. She also commented that after eating 3 slices, she did not feel bloated as she usually does after eating pizza.